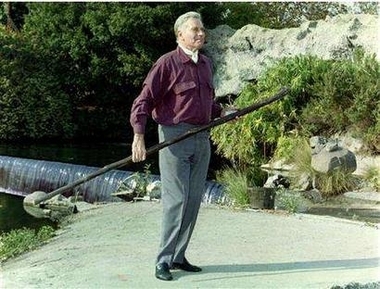 Chuck was scheduled (in 2002) to film a new four-hour documentary called "IN THE FOOTSTEPS OF MOSES," covering the ground where Moses walked. Heston was to host and narrate this film, which was to be produced by his own company, Agamemnon Films. This was to be a sequel of sorts to Chuck's hugely popular (and critically acclaimed) 1990s "Charlton Heston Presents the Bible" cable series. Unfortunately, due to Heston's declining health, both of the above projects were never made. ###The Greatest Heston Film Heston Never Made (? ): "THE INVESTIGATION": Variety first reported in May of 1982 that Charlton Heston would play Pontius Pilate alongside Michael York as a Roman centurion in this Italian-financed Biblical epic. "The Investigation" would tell the story of an inquiry ordered by Rome to locate the body of Jesus after his death. The film was eventually made, but with Harvey Keitel (!) and Keith Carradine in the Heston and York roles, respectively. It was released as "The Inquiry" ("L'Inchiesta") in Italy in 1987. 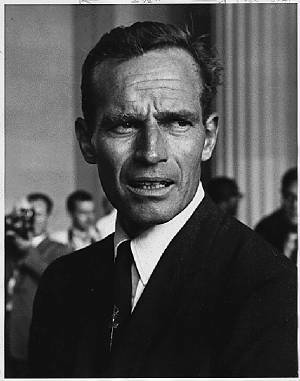 UNREALIZED 1960s HESTON PICTURE: According to the TimesOnline of April 9, 2008, Charlton Heston was scheduled in the mid-sixties to star in a movie adaptation of famed war correspondent Robert Elegant's first novel (1966), "A KIND OF TREASON." It's a contemporary thriller set in war-torn Vietnam about a veteran CIA agent named Mallory leading an investigation into a top-secret leak. Alas, the film was never made. *A HESTON QUESTION: How many times has Chuck played a Cop in Films? Three: "Soylent Green" (1973), "The Last Hard Men" (1976), & "Two-Minute Warning" (1976).